Since their mother's death, Sadie and Carter have become near-strangers. While Sadie has lived with her grandparents in London, Carter has traveled the world with their father, the famed Egyptologist Dr. Julius Kane. One night, Dr. Kane brings the siblings to the British Museum, where he hopes to set things right for his family. Instead, he unleashes the Egyptian god Set, who banishes him to oblivion and forces the children to flee for their lives. Soon, Sadie and Carter discover that all the gods of Egypt are waking, and that Set now has his sights on them. To stop him, the duo embarks on a dangerous journey across the globe, one that brings Carter and Sadie ever closer to the truth about their family and its connection to a secret order that has existed since the time of the pharaohs. 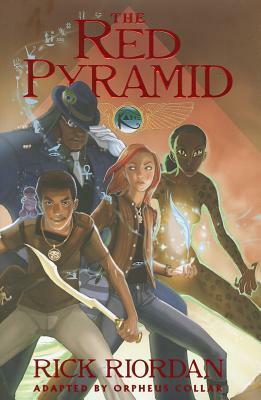 The heart-stopping action and magic explode off the page in The Red Pyramid, The Graphic Novel, based on the worldwise best-selling novel by Rick Riordan. Rick Riordan (www.rickriordan.com) is the author of the New York Times #1 best-selling The Kane Chronicles, Book One: The Red Pyramid and Book Two: The Throne of Fire. His other novels for children include the New York Times #1 best-selling The Heroes of Olympus, Book One: The Lost Hero and Book Two: The Son of Neptune, as well as the five books in the New York Times #1 best-selling Percy Jackson and the Olympians series. He lives in San Antonio, Texas, with his wife and two sons. Orpheus Collar (www.orpheusartist.com) is a storyboard artist and illustrator who received his BFA from the Maryland Institute of Art. He has contributed his coloring skills to numerous titles, including The Amazing Spider-Man and Ultimate X-Men. Orpheus also provided the storyboards for The Lightning Thief: The Graphic Novel. Orpheus lives in Los Angeles, California.